We’re open this Saturday – don’t worry if its raining as we’re all inside a massive hangar (Trust me the rain will sound cool alongside our guest musician Simon Tall)! Join us from 9am onward to find a variety of tasty fresh produce and artisan delights; Everything from local beef, lamb or chicken to free-range eggs, pastries, handmade chocolate, raw milk, preserves and organic bottled ale, or even beautiful hand spun and knitted wool products … The list goes on! … Why not come along and see for yourselves! You’ve got until Thurs night to pre-order online from the food assembly. Our cooking demonstration and tasters will be back this week alongside the Market Raffle where one lucky visitor will win over £30 worth of delicious goodies and market gifts with a ticket that cost just 50p! Don’t forget the BBQ with local beef burgers, sausages and bacon and the hot drinks and cakes in the cafe area. Ample parking and toilets available. You can view the full list of our stallholders here. Due to the nature of the farmers markets we often have vacancies, we’re currently recruiting a traditional CAKE STALL please help us spread the word. We’re looking to recruit volunteers to help with the coordination and promotion of our farmers market – If you can offer some time or pro-bono support we would love to hear from you! Is there something we can help you with or trade? We’re looking for innovative ideas. Would you like to host a demonstration or activity at the farmers market? Are you interested in blogging about our great network of local producers? Are you a whizz with promoting events or writing press releases? Interested? 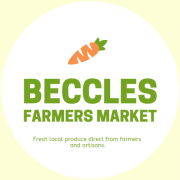 Then email becclesfarmersmarket@gmail.com – we’re a friendly bunch with skills to share :).